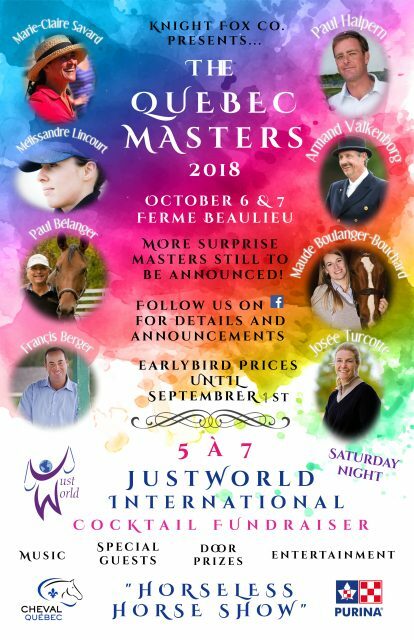 Quebec Masters 2018 – The Knight Fox Co.
Come join us for this one of a kind, integrative clinic focused on the learning and education of our auditors/spectators. Eight of our top Quebec coaches, along with some surprise guests will present 90 minute mini clinics over a two day period. Riders must apply to ride and will then be matched with a Master for this educational event not to be missed. Brought to you by The Knight Fox Company. This will be a bilingual event. Translators onsite. Proudly, our event is now officially affiliated with a non profit organization called JustWorld International. JustWorld International is devoted to breaking the cycle of poverty around the world helping children thrive. They support more than 6,500 children by providing access to education, nutrition, health & hygiene, and leadership & cultural development programs. (Honduras, Guatemala and Cambodia). The organization is founded by American actor Paul Newman’s daughter, Jessica Newman. Saturday night, we will hold a cocktail fundraiser for Justworld international with 100% of proceeds going to Justworld. Please come join us for a wonderful evening. Riders: Riding spots will be prioritized to Cheval Quebec’s PDE athletes (present and past) and certified coaches. A financing program for riding in the symposium is available for PDE riders and coaches. 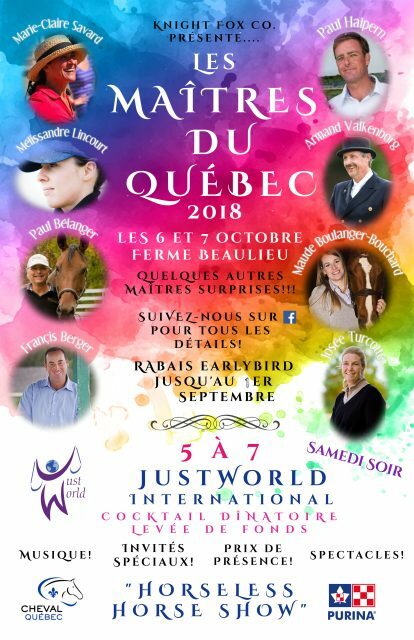 If any riding spots remain available, the Quebec Masters 2018 will open the event for riders from the general public to apply to ride. Please note that rider applications close September 15.